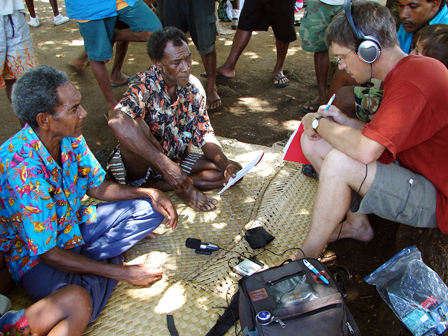 I have collected firsthand data on several languages of Vanuatu and the Solomon Islands, which were little documented until recently. All these languages are Austronesian, more precisely Oceanic. For each language, the tables below indicate its geographical location; the name which I use and recommend – based on the speakers’ preferences – as well as alternate names under which it has been called in earlier publications. I propose an estimate of their current number of speakers. Finally, I give relevant links to further information, and to online texts with their translation. The last column links to all my audio archives from the field (see also this selection of stories). I am currently working on the systematic description of some of these languages. Part of this research has already been published. The numbers of speakers proposed below were revised in October 2010. I recalculated the figures by extrapolating them from the recently published demographic figures given, island by island, by the 2009 Vanuatu census [link to VNSO’s site; direct link ]. The 2009 total population of Torres & Banks islands ("TorBa" province) was 9359 individuals. This shows a demographic increase of 20.7 percent from the last 1999 census, which had a figure of 7757. Note: This chart cites only those languages of Vanuatu on which I have personally collected data on the field. For a full list of the 138 languages spoken in Vanuatu, see our map, and the article that comes with it. I have revised the figures for numbers of speakers based on my May 2012 survey, and also taking into account the 2009 Solomon Islands census. Note: This chart cites only those languages of the Solomon Islands on which I have personally collected data on the field. For a full list of the 74 languages spoken in the Solomons, see the Ethnologue’s page.